A fellow western writer once told Preston Lewis that he wrote funny. Now that could’ve been taken as an unflattering comment were it not for H.H. Lomax, a character Lewis created in the 1990s at the invitation of Bantam and Book Creations Inc. As it turns out, Lomax just happened to have left a trail of chaos and hilarity throughout the Old West. If something went wrong in the West, Lomax was probably somewhere in the background. In The Memoirs of H.H. Lomax the Arkansas native recalls his encounters with Billy the Kid, Jesse James, Doc Holliday, Wyatt Earp, Johnny Ringo and other legends of the Old West. Based on a cache of recollections handwritten on Big Chief Tablets, the Lomax stories show more about how the West was fun rather than how the West was won. Lomax seldom succeeds, but he always survives. Based on sound historical research, Lomax’s exploits are sure to leave readers with grins on their faces as Lomax stumbles and bumbles his way across the Old West. 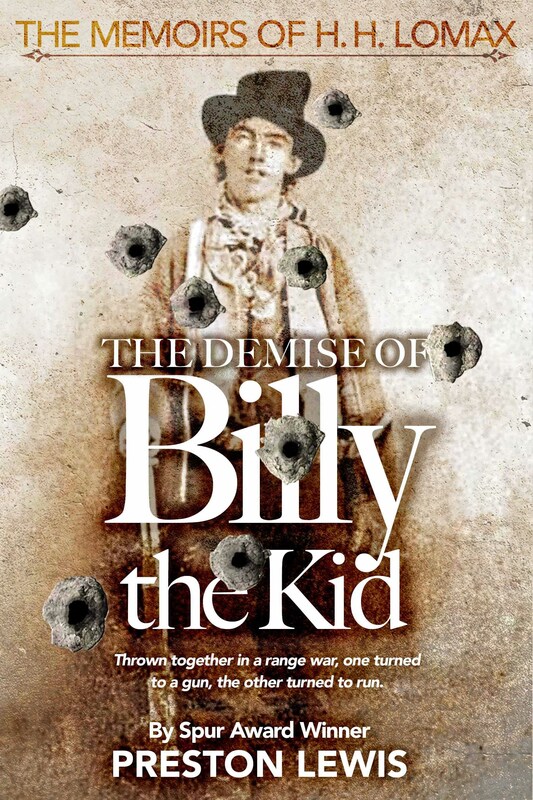 Explore what really happened in the Lincoln County War, at least from Lomax’s perspective, in The Demise of Billy the Kid. The Redemption of Jesse James: Everyone knows Jesse James was straightening a family photo on the wall when he was shot, but few realize that it was Lomax who bumped the wall in the first place. 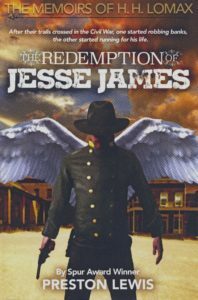 Set in Civil War Arkansas and Missouri, The Redemption of Jesse James is the coming of age story of H.H. Lomax. As Lomax remembers it, “The truth of the matter is I might never have met any of the James family had it not been for Abraham Lincoln. Old Abe—not some cannonball over Fort Sumter and not slavery—brought on the War Between the States, and the war brought out the meanness of folks in the Ozarks.” Caught between boyhood and maturity, Union sympathizers and Confederate bushwhackers, Lomax must grow up in trying times. Even a fortune in Confederate gold only adds to Lomax’s troubles as he tries to help his family survive the shifting alliances and increasing deprivations of Civil War Arkansas. For mutual safety, Lomax’s family must share their home with the neighboring Burke family, including Pooty Burke, Lomax’s childhood nemesis, and Pooty’s three ugly sisters. Before he is forced to take up with Jesse James, Lomax survives ambushes, his own hanging, and his first love. Experience the poignancy and hardships of Civil War Arkansas in The Redemption of Jesse James. Mix-Up at the O.K. Corral: As Lomax recalls, “Things might have turned out different in Tombstone if I hadn’t had a toothache and Doc Holliday hadn’t had bad breath. A lot of men died as a result, though not likely as many as needed killing.” So begins Lomax’s sojourn in Arizona Territory. Though he opens a successful saloon in Tombstone, Lomax soon finds himself caught between the rock of the Earps and Doc Holliday and the hard place of the Clantons and Johnny Ringo. 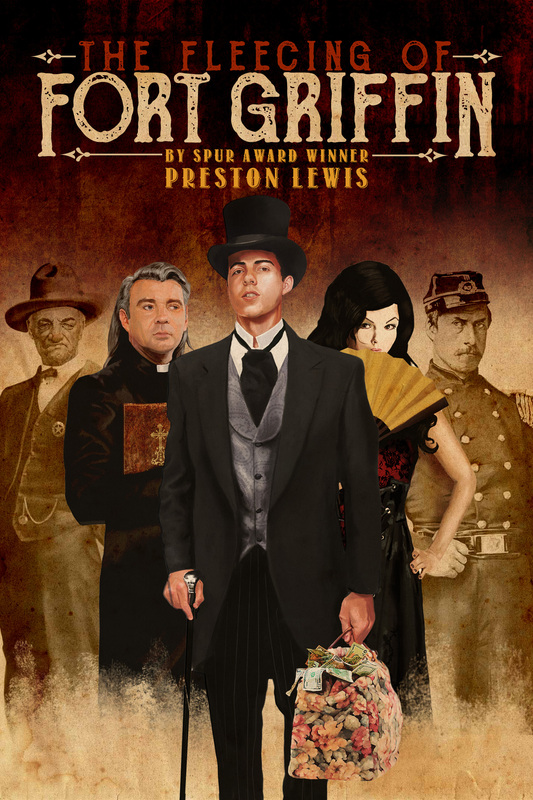 Though he must use his wits to survive, Lomax is soon scared witless by the many bad men who are corrupting the politics of Tombstone for their own gain and a crooked lawyer. As if that isn’t enough, Lomax clandestinely courts a young lady from a powerful family and must contend with a cat aptly named “Satan.” By then Lomax has made so many enemies everyone is making bets on where Lomax will be shot. On the day of the climactic gunfight at the O.K. Corral, Lomax is being hunted by the Earps and Holliday, who intend to settle their scores with him. When they encounter the Clantons and McLaurys instead, Old West history is made, but not without Lomax’s contribution to the affair. 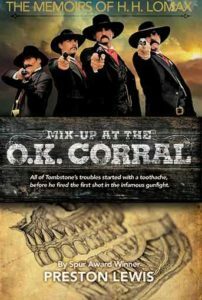 Unravel the events that preceded and followed the famous gunfight as Lomax saw them in Mix-Up at the O.K. Corral. Before he runs into Custer, Lomax survives the Battle of Adobe Walls, works as a bouncer in a Waco brothel, prospects for Black Hills Gold with two naive telegraphers and tends bar in a Dakota saloon. 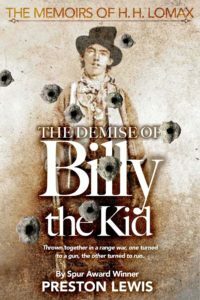 Along the way he hunts buffalo with Bat Masterson, renews his friendship with Buffalo Bill and denies allegations of a feud with Wild Bill Hickok. 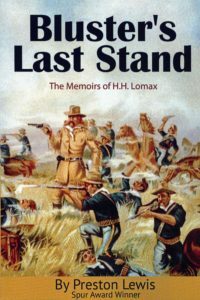 Told with Lomax’s characteristic wit, Bluster’s Last Stand takes readers on a humorous romp across the Old West. 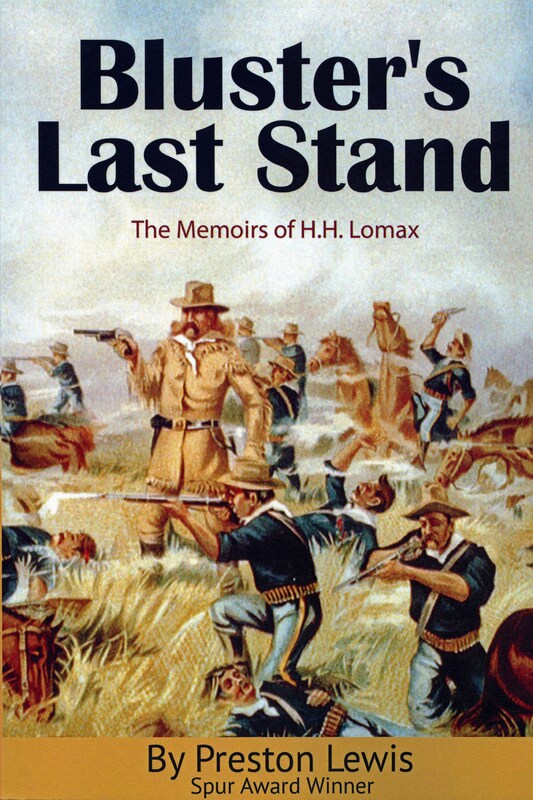 Learn what really happened at the Little Bighorn as Lomax recalled it in Bluster’s Last Stand. Capers form a literary subgenre more generally associated with Mystery novels than with Westerns. Standard caper elements include oddball characters, plot twists and a surprise ending. The Dortmunder mystery series by Donald E. Westlake ranks as one of Preston Lewis’s favorites for plot twists and humor, influencing his comic writing. Among movies, the Academy Award-winning The Sting plus The Usual Suspects could be considered capers. 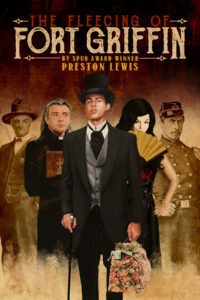 The Fleecing of Fort Griffin is Lewis’s first western caper. The Fleecing of Fort Griffin: Word spreads fast when a crazy Englishman planning to start a buffalo ranch arrives in Fort Griffin with a satchel full of money to buy land. Swindlers from all over West Texas arrive in town to fleece Baron Jerome Manchester Paget of his savings. The con artists include the crooked gambler Joe Loper, the miracle-working Rev. G.W. “God Willing” Tuck and Wallace and Amanda Sikes, who pull a jealous husband scam. Then there’s professional widow Flora Belmont, who’s buried five husbands, and the dangerous gunman “One-Eyed” Charlie Gatliff, who figures to cut to the bone of the matter and just shoot the Englishman for his money. Mix in the eccentric Fort Griffin residents that are awed by royalty, and Baron Paget is up against an army of Texans more interested in his money than his safety. Only the orphan Sammy Collins and the baron’s rooster, which Paget uses as a guard instead of a watchdog, seem to be on his side. Travel with Baron Paget as he tries to survive his stay in The Fleecing of Fort Griffin.